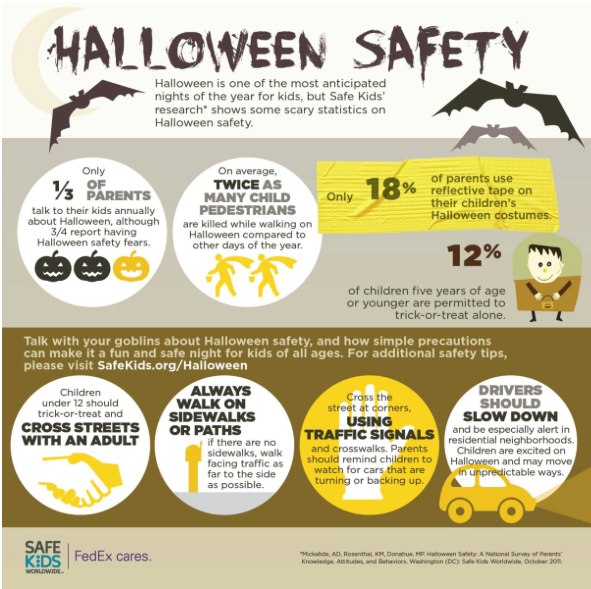 Trick-or-treating, and fear-filled fun may be what many children anticipate with Halloween approaching, but approximately 75% of parents have concerns regarding safety as it relates to Halloween. With fall festivals, trick-or-treating, and other activities it is important to discuss Halloween safety guidelines with your children. We’ve gathered a few helpful reminders from Safe Kids Worldwide and the Centers for Disease Control as they relate to this annual Autumn tradition. Make sure that any long hanging materials, such as dresses or capes, are pinned to an appropriate length to help avoid tripping. Any weapons or accessories associated with the costume should be made out of soft and flexible materials. Reflective tape strategically placed on a child’s costume can help make them more visible after dark. Glow sticks or flashlights make excellent accessories to help make children visible to drivers after dark. Always inspect candy before children dive in to enjoy their goodies. Look carefully for wrappers that appear to be open or that have been tampered with and for any choking hazards. Discard any candy or treats that are not individually wrapped. Children under the age of 12 should be accompanied by an adult when trick-or-treating. Only children over the age of 12 that are responsible enough should be granted the privilege to trick-or-treat without an adult. If a young adult is granted the opportunity to trick-or-treat without an adult they should always have a friend or group of friends with them. It is important to stay in familiar areas. Stay safe this Halloween, and don’t forget to share your Halloween pictures with Sixes Living!